The Independent Tree Panel’s purpose is to provide an opinion on the results of the ‘Household Survey’. Sheffield City Council (SCC) claim that the survey consults the wishes of Sheffield people, however, in case after case, both residents and the Independent Tree Panel (ITP) have voted to keep trees only to have their views overruled. The ‘Household Survey’ has been widely seen as an attempt to divert attention away from the undemocratic nature of the ‘Streets Ahead’ PFI contract. If that was the intention, it seems to have failed. 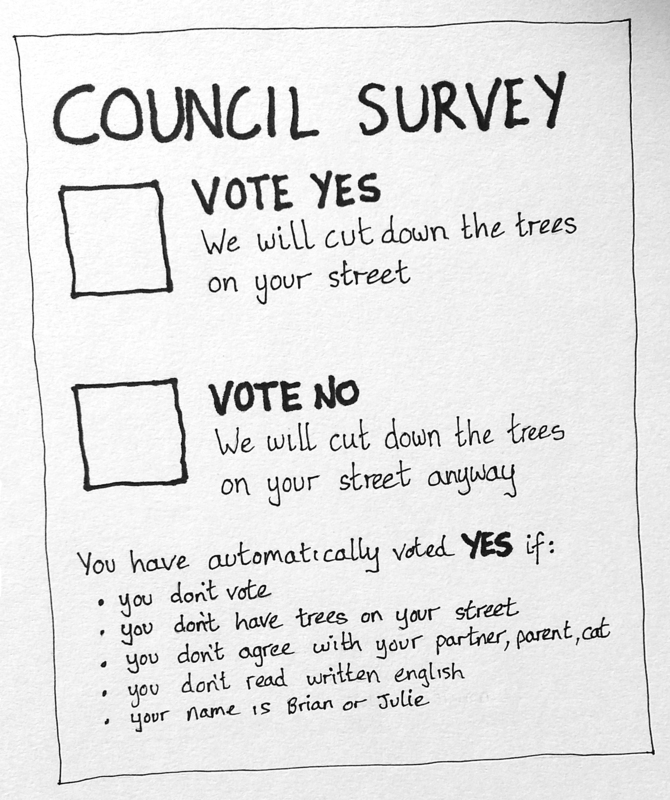 In streets with trees that are deemed to be ‘damaging’ the pavement or kerbs, SCC gives each house one questionnaire – regardless of how many people actually live there. Each household is given a single choice to vote for or against retaining the trees in their street – this does not allow for any differences of opinion if two or more people occupy that address. SCC hand-delivers questionnaires through each letterbox in plain, unmarked envelopes with a cellophane window showing that it is addressed ‘To the Occupier.’ Unsurprisingly many were mistakenly binned as junk-mail. In a recent door-to-door survey over 50% of households told STAG that they did not know that the survey was happening. The response rate across the city has been very low. In streets where more houses vote in favour of keeping the threatened trees, the trees are referred to the ITP who then give an opinion on whether the trees should be retained or not. In streets where more houses vote to remove the highway trees, the threatened trees are not given further consideration and are listed to be removed. Even when survey results have shown that a greater number of households has voted to save the trees in their street, and even when the ITP has also recommended keeping them, SCC has, in most cases, overruled both opinions and insisted on removal. In Briar Road, S7, 100% of the residents who responded to the ‘Household Survey’ wanted to keep their trees; the ITP voted to retain them all, however SCC has ordered Amey to remove them. As of 6th June 2017, out of the 150 trees that the ITP has voted to retain, SCC has ignored their advice 87.3% of the time and listed 131 to be cut down! Approximately £200,000 will have been spent administering this process. The ‘Household Survey’ and the ITP have delayed Amey’s schedule, which means that under the terms of the ‘Streets Ahead’ contract SCC will pay penalty charges to Amey. It is estimated that this will be in excess of one million pounds. 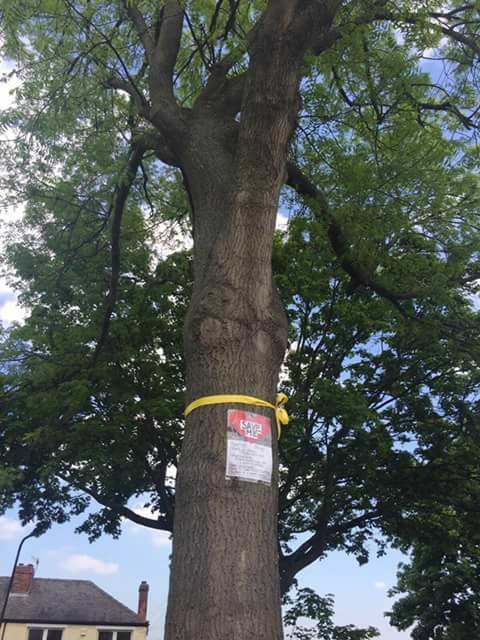 STAG, members of the ‘Tree Forums’ and SORT have all asked SCC to commission a credible Tree-Strategy to guide their decisions about which trees to remove. Instead Sheffield came up with the ITP process. It is hard to see how an expert Tree-Strategy could have been anywhere near as costly. STAG has done it’s own ‘door-to-door’ surveys. Our figures disagree with SCC’s published results. 14 households (39% of respondents) agreed with felling plans. 21 households (58% of respondents) disagreed with felling plans. 1 household (3% of respondents) did not know what they thought. Only 4 household’s responses had been registered. Of these, 3 agreed with felling, 1 disagreed. What happened to the other three responses? STAG’s figures show that out of the 36 households they spoke to, 21 (58%) were against felling the trees in their street. Yet Balmain Road’s trees were not referred to the Independent Tree Panel and some have already been felled, including the ash pictured. Many residents are understandably upset. • None of us lives in a street forever. Compared with trees, humans are a short lived species. Many of Sheffield’s highway trees will live for another 150-200 years if properly maintained. The survey means that a small number of householders living on the street today are making decisions that will affect the health and wellbeing of future generations. • Sheffield has experienced serious flooding leading to loss of life. Many of Sheffield’s leafier suburbs are on higher ground and fully grown trees soak up large large quantities of water that might otherwise flow downhill and flood low-lying land. Other Local Authorities (such as Salford City Council and Calder Valley) have actually planted trees on high ground as a first line of defence against flooding. It is short-sighted to remove so many large trees in such a short space of time. A statistically small number of households should not dictate the future location of this integral part of Sheffield’s flood defences. • Air quality is poor in many parts of Sheffield, causing approximately 500 deaths every year from respiratory conditions. Street trees produce oxygen and are an important part of the fight against pollution. Removing highway trees because of the views of a small number of households affects the respiratory health of not only the people living in that street but also the wider community. • Questionable reasons have been cited by people wanting to get rid of the particular tree that is standing outside their house. “The leaves make a mess in Autumn” – cleaning pavements and highways is Amey’s job. “It’s blocking the light” – Sheffield’s highway trees have been neglected for many years, basic maintenance such as thinning and crown-reduction usually puts this right. “We want to build a drive or extension” – SCC have said that this is not a valid reason for removing a highway tree. Even so, the survey has created a situation where such reasons are fuelling a household’s decision to have trees felled. Please note: STAG does not automatically disagree with every resident’s wish to remove highway trees close to their homes. Read STAG’s leaflet that responds to resident’s FAQs about street trees. • House prices are higher in streets with highway trees, and shops and cafes benefit from increased profits. This is particularly significant since many of Sheffield’s Housing Estates are having large numbers of healthy trees removed. People who have used the ‘Right to Buy’ their council homes will find their properties devalued. Householders in Sheffield’s many modest streets, where highway trees contribute so much to the attractiveness of the area, could find themselves affected. The views of a few households could affect the financial wellbeing of many. 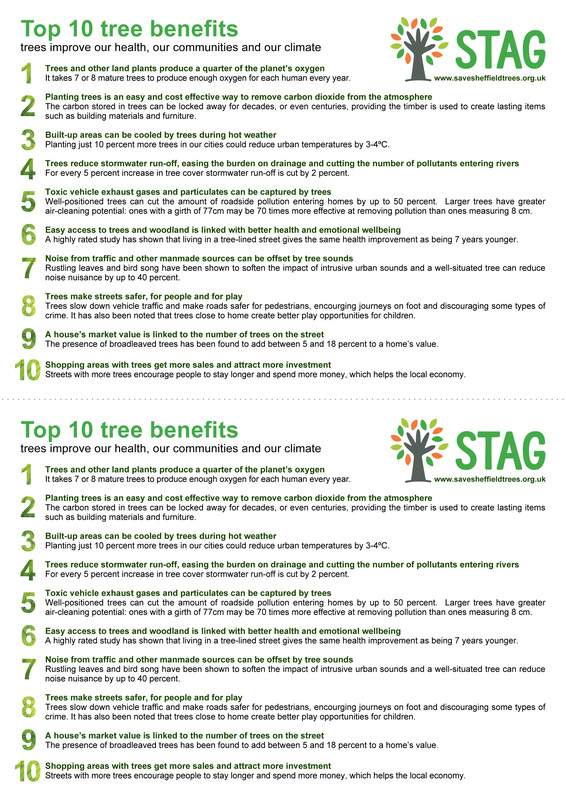 Read STAG’s leaflet on the benefits of street trees. • The ‘Household Survey’ has damaged neighbourhood relations by dividing communities. In spite of differences in socio-economic status Sheffield is deservedly famous for its strong sense of social cohesion. When other cities have rioted Sheffield has not. Since the survey bitter disputes have broken out between neighbours registering opposing views. The tree, or more often the space where it once stood, is a permanent daily reminder of the dispute. This could have been avoided – it is the responsibility of Local Authorities to avoid unnecessary social division. For the sake of a phoney ‘consultation’ exercise, SCC and Amey have weakened the threads of Sheffield’s social fabric. Balmain Road, where 21 households that we spoke to were against felling the trees in their street. 1. Those approached must be either the whole of the target audience or population or a suitable sub-sample. In the case of small populations (e.g. the residents of a single street) it is obvious that they must all be approached (100% sample). 2. It must be clear to the target population that they are being approached. 3. The means of responding must be as clear and simple as possible, and preferably the same for all respondents. 4. The number replying (response rate) must be large enough to represent fairly the range of views in the population. Sheffield’s tree surveys appear to have met none of these requirements. Requirement 1: The target population in each street should be all adult residents; limiting responses to one per household, even if every household responded, could not constitute a 100% sample. Requirement 2: Given that so much of unfranked and unrequested mail is immediately discarded, official messages from central and local government (e.g. electoral registration) are routinely highlighted as important, with enough explanation on the outside of the envelope to ensure that they are attended to. Delivery of a survey letter in anonymous plain envelopes makes a nonsense of this. Requirement 3: It is still not the case that every household or person has access to the internet, and even fewer might be comfortable with answering a survey online, given the security rigmarole. It is also known from research that differing response modes affect response rates (percentage who answer at all) and response biases (whether people are more likely to answer positively or negatively), so having two ways of responding (online or by phoning up for a paper form and returning it), which may have seemed responder-friendly, was actually certain to cloud the outcome. Since paper response forms are available, they could have been enclosed with the initial request. The actual way survey responses were requested could hardly have been better designed to confuse, and to ensure the response rate was low. – reproduced with Professor Brook’s kind permission. Bristol City Council took expert advice on highways, ecology, public health, arboriculture, air quality and national ‘best practice’ guidelines concerning the urban landscape. Their council officers used this advice to form comprehensive long term plans for highway trees. They took all the necessary factors into consideration, for the benefit of present and future generations. Bristol did involve members of the community, but at the right level, when their input was appropriate and constructive.